The Holy Spirit Dove Ruby Purity Engagement Ring Set is a modern ring that entices imagery of a blooming rose standing tall within the bridal bouquet. 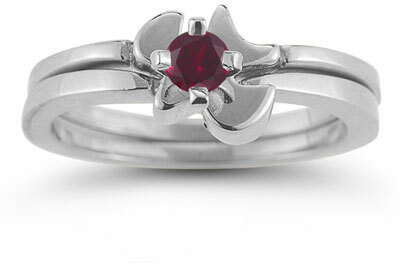 The 14k white gold band offers a simple elegance while the dove creates a unique setting for the ruby gemstone to shine. The design of the ring draws the eye to the rich red and subtle pink tones in the stone. The white gold ring features a stylistic design where the bands are. Each of the bands measure 2.8mm wide to create one engagement set. The white gold is polished to a flawless luster that leads the eye to the flowing dove design. The dove holds the 5mm round-cut ruby in place, illuminating the stone from beneath, allowing the ruby to radiate light from top to bottom. This ring was carefully constructed to imbue the simple elegance of rose petals and to accentuate the natural beauty of the new bride. Giving such a symbolic ring as an engagement set would forever make a lasting impression. We guarantee our Holy Spirit Dove Ruby Engagement Ring Set, 14K White Gold to be high quality, authentic jewelry, as described above.